Rep. Tulsi Gabbard (D., Hawaii) said the United States should stay out of Venezuela and claimed U.S. involvement in the country's politics is "about the oil." "The United States needs to stay out of Venezuela. Let the Venezuelan people determine their future. We don't want other countries to choose our leaders—so we have to stop trying to choose theirs," the Democratic presidential candidate tweeted last week. "It’s about the oil … again," Gabbard tweeted on Monday. "Bolton just exposed real motive for intervention in Venezuela: ‘We're in conversation with major American companies now…It would make a difference if we could have American companies produce the oil in Venezuela. We both have a lot at stake here.'" 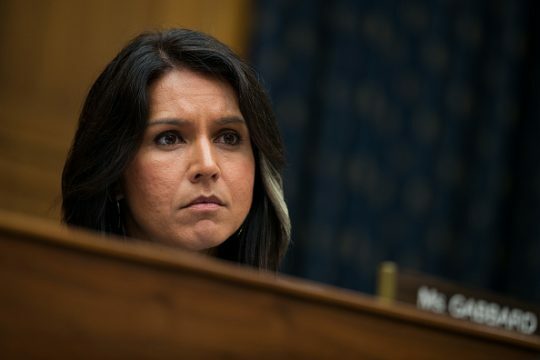 The Washington Free Beacon asked Gabbard's campaign if she was expressing opposition to the United States' recognition of Juan Guaido as Venezuela's president, or if she was warning against further sanctions or some form of military intervention in Venezuela by the United States. A spokesperson responded Tuesday, "All of the above." We are in conversation with major American companies now that are either in Venezuela or in the case of Citgo here in the United States. I think we are trying to get to the same end result here. Venezuela is one of the three countries — I call it the troika of tyranny. It'll make a big difference to the United States economically if we could have American oil companies really invest in and produce the oil capabilities in Venezuela. It would be good for the people of Venezuela, it would be good for the people of the United States. We both have a lot at stake here making this come out the right way. Venezuela is in the midst of a constitutional crisis involving its authoritarian leader Nicolas Maduro and National Assembly president Juan Guaido. Maduro was sworn in for a second term this month after an election that dozens of countries, including the United States, called a sham. Guaido, citing the country's constitution, called for elections and declared himself interim president last week. The United States, Canada, and several Latin American countries have recognized Guaidó as Venezuela's legitimate leader, while Russia, China, Iran, Turkey, Cuba and several others have stood with Maduro. Gabbard has a reputation for opposing American intervention around the world, and her foreign policy views have drawn criticism from some on the left. UPDATE: Tuesday, 9:28 P.M.: This article was updated with the Gabbard campaign's response to the Free Beacon‘s question about her tweets. This entry was posted in National Security and tagged 2020 Election, Tulsi Gabbard, Venezuela. Bookmark the permalink.